I have long been a pavaholic but this is my first venture into a fruit-free version. 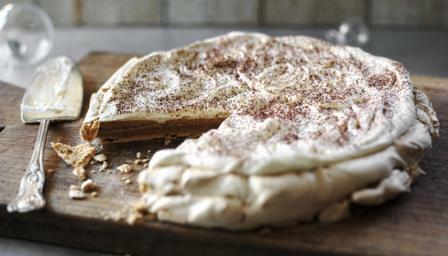 The instant espresso powder (do not use regular instant coffee granules) gives bitter oomph to the sweet, marshmallowy meringue. Whip the double cream until thickened and airy, but still soft, and spread this delicately over the top (which previously was the bottom!) of the meringue. With a teaspoon, push the cocoa powder through a fine sieve or tea strainer to decorate – cappuccino-style – the top.